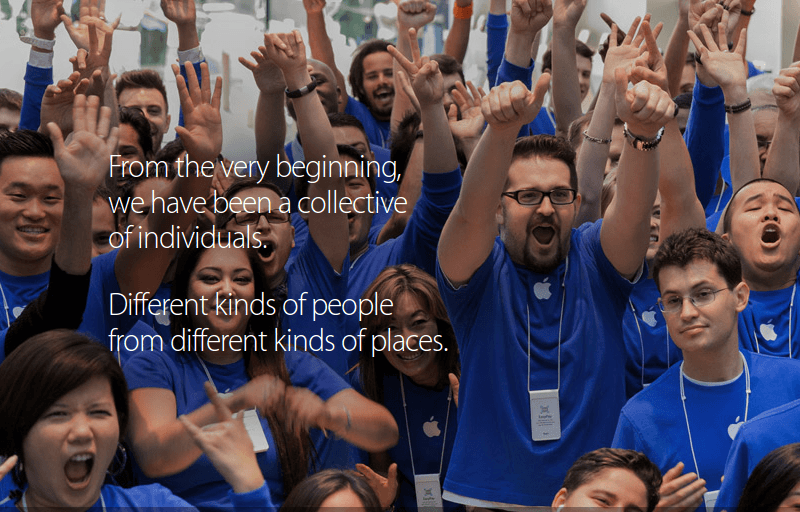 Apple's US workforce mainly consists of whites, Asians, and males, according to a diversity report released by the company today. The report comes a month after Apple CEO Tim Cook said the company would detail the demographics of its work force. Overall, 70 percent of the company's employees are men. A further breakdown reveals that 80 percent of its tech employees, 72 percent of its leadership team, as well as 65 percent of its non-tech employees are men. As far as race and ethnicity is concerned, 55 percent of the company's employees are white, 15 percent are Asian, while Hispanics and blacks make up 11 percent and 7 percent of the workforce, respectively. Nine percent of workers did not declare their ethnicity and 2 percent identified themselves as multiracial. Among its leadership ranks, whites make up 64 percent, Asians make up 21 percent, while Hispanics and Blacks make up 6 percent and 3 percent of the company's workforce, respectively. "Apple is committed to transparency, which is why we are publishing statistics about the race and gender makeup of our company. Let me say up front: As CEO, I’m not satisfied with the numbers on this page", said CEO Tim Cook. "We are making progress, and we’re committed to being as innovative in advancing diversity as we are in developing our products". Cook also noted some recent executive team hires, including Angela Ahrendts, Lisa Jackson, and Denise Young-Smith, that have boosted the number of women in the company’s upper management. "Apple's are a bit better than the others but not by much", said longtime civil rights leader Rev. Jesse Jackson, who has led a campaign to get Silicon Valley companies to release their diversity reports. Other tech companies, including Google, Facebook, Yahoo, LinkedIn, Pinterest, eBay, and more, have already released similar reports.